"Spotting a dog in transit can bring a small joy to the morning commute, but man's best friend isn't always welcome — or legal — on the New York City subway. 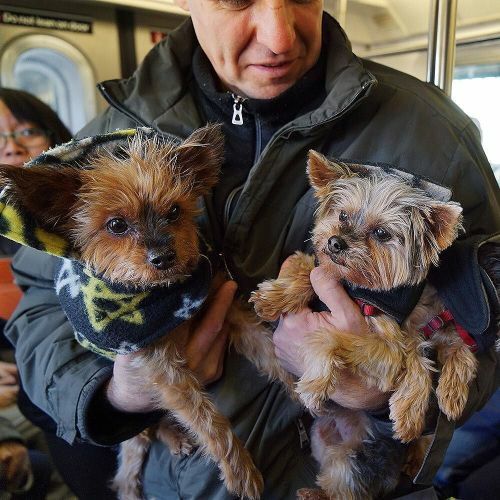 While the @mtanyctransit rule states that dogs must travel in closed carriers, regular riders will tell you they're seeing more dogs in plain sight on platforms and trains. So, what's the fine for riding with an unauthorized animal? Just $25, lower than the penalty for smoking ($50) or fare evasion ($100). @bengiville photographed Amaru Alzogaray, a dog walker, transporting Alex, Sophia and Titi — the 3 Yorkshire terriers for which he regularly cares — on the No. 7 train from Manhattan to his home in Queens. #🐶" By nytimes on Instagram.